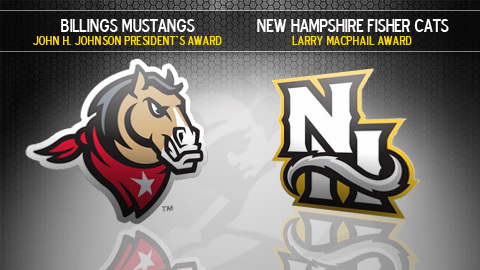 ST. PETERSBURG, Fla. -- Minor League Baseball announced Monday that the Billings Mustangs and the New Hampshire Fisher Cats, respectively, are the winners of the John H. Johnson President's Award and Larry MacPhail Award. The Mustangs and Fisher Cats will receive their major awards at the Baseball Winter Meetings™ Banquet at the Walt Disney World Swan and Dolphin Resort near Orlando on Thursday, Dec. 9. The President's Award, Minor League Baseball's top accolade, is presented annually to honor the complete baseball franchise--based on franchise stability; contributions to league stability; contributions to baseball in the community; and promotion of the baseball industry. The Billings Mustangs club was founded by a group of local business persons and was incorporated as a "community-owned" club in 1948. It continues to operate as such today. Profits from the operation of the Pioneer League club are reinvested into improvements in their stadium, rather than distributed to stockholders as dividends. The Mustangs have provided Billings and its surrounding communities with professional baseball in its most simple and purest form with the same commitment and mission they had 62 years ago -- to provide fans with quality and affordable food and beverages, free parking and low ticket prices. Billings has been affiliated with the Cincinnati Reds since 1974. Their 37-year partnership is tied for sixth-longest among Minor League clubs. "We are thrilled, humbled and deeply honored to be selected as this year's John H. Johnson Award recipient," Mustangs General Manager Gary Roller said. "It is a prestigious award and we feel privileged to be placed in the company of the previous winners. "The successes that we've been fortunate enough to experience as an organization are largely due to both the fans and business partners that we have in the area, and each deserves much of the credit for this award." Two years ago, the city of Billings and the Mustangs opened Dehler Park, a new facility that replaced Cobb Field, the only home the club had known since its beginning. Dehler Park will help ensure that the Mustangs franchise remains an integral part of the Billings community for years to come. "The Billings club symbolizes all that is good about Minor League Baseball," Pat O'Conner, President of Minor League Baseball, stated. "The team's place in the Billings community has only been enhanced with the new stadium. "The Billings Mustangs continue to provide leadership and guidance to the Pioneer League and fellow league members. These factors, along with an efficient and successful operation, qualify the club as one of our best and a worthy winner of our highest honor, the John H. Johnson President's Award." The Mustangs, who annually support charities, organizations and fund-raising events through cash, ticket and merchandise donations, were also presented with the Johnson Award in 1994. Since its inception in 1974, only Albuquerque (1984, 1991); Iowa (1978, 2002); Rochester (1974, 2004); and Tacoma (1975, 1982) have won the John H. Johnson President's Award more than once. The Larry MacPhail Award symbolizes the top promotion effort in Minor League Baseball. The Fisher Cats strive to create as many magical moments as possible for their fans at Merchantautos.com Stadium with over 35 promotions per game. Some of the new promotions this season included the Fisher Kittens dancers, Ollie the bat dog and the Rally Rave. In 2010, the club held 40 theme events, 27 premium giveaways, a dozen student appreciation nights and 25 fireworks shows in attracting over 386,000 regular season fans. New Hampshire also attracted its 2,000,000th fan on their way to finishing among the top four drawing clubs in the Eastern League for the fourth straight year. "We are thrilled to be awarded the Larry MacPhail Award this year," said Fisher Cats President Rick Brenner. "It is a testament to our community, our fans and the amazing job our staff does here every day. It is an honor to be recognized for this award, especially with so many deserving candidates throughout the nation in the running for it every season." "The New Hampshire Fisher Cats have quickly become a hot ticket along the Eastern seaboard," O'Conner said. "The team's creative approach to promotion, community service and fan enjoyment has been a huge success. The ownership, management team and staff are all committed to producing a high quality first-class experience for the fans. The 2010 Larry MacPhail Award fittingly goes to the New Hampshire Fisher Cats." Among its many community-based contributions, The Fisher Cats Foundation awarded $30,000 in scholarships to 12 college-bound students in 2010. The foundation's annual Granite State Baseball Dinner raised over $158,000, a record for the event which helped bring the total monies raised in the four years of the dinner to over a half-million dollars. Since 2006, New Hampshire has hosted 482 fundraisers at its ballpark, helping more than 1,900 nonprofit organizations raise over $1.6 million. NEXT: Warren Giles Award and Rawlings Woman Executive of the Year, Nov. 10; Sheldon "Chief" Bender & Mike Coolbaugh Award winners, Nov. 15.